Abstract: The restoration of damaged posterior teeth using direct composite materials is an integral component of contemporary dental practice. Resin-based materials are now routinely used to solve a wide range of restorative problems from the minimally invasive management of early carious lesions to the total restoration of severely worn dentitions. 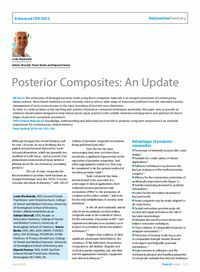 As there is a wide variation in the teaching and practice of posterior composite techniques worldwide, this paper aims to provide an evidence-based update designed to help clinical teams equip practices with suitable materials and equipment and optimize all clinical stages of posterior composite procedures. Clinical relevance: Knowledge, understanding and advanced practical skill in posterior composite restorations is an essential requirement for contemporary clinical dentistry. Author notes: Louis Mackenzie, BDS, General Dental Practitioner and Clinical Lecturer, College of Dental and Medical Sciences, University of Birmingham School of Dentistry. Email: L.Mackenzie@bham.ac.uk. Adrian Shortall, DDS, Reader in Restorative Dentistry, College of Dental and Medical Sciences, University of Birmingham School of Dentistry, Trevor Burke, DDS, MSc, MDS, MGDS, FDS(RCS Edin), FDS RCS(Eng), FFGDP(UK), FADM, Professor of Primary Dental Care, College of Dental and Medical Sciences, University of Birmingham School of Dentistry and Dipesh Parmar, BDS, MJDF, DipOrth, General Dental Practitioner, Moseley, Birmingham B13 0AW, UK. Objective: To provide an evidence-based update on all clinical stages of posterior composite procedures.